Online Visibility designed specifically for Medical Professionals. Turnkey marketing solution made easy. You're almost there, just fill in some basic information! Our team will will get in touch with you shortly. The medical and health industry is undergoing a marketing revolution. Traditional offline advertising is quickly becoming a thing of the past. But converting the increasing number of consumers who turn to the web for medical information isn’t easy. DoctorQA.com’s performance based marketing packages make attaining measureable returns on your marketing budget dead simple. The DoctorQA.com team has 10 years of experience converting search engine traffic into customers for our clients. We create a competitive advantage for our clients by optimizing them over their competitors in the search engines, which results in a quantifiable increase in potential patient inquiries. 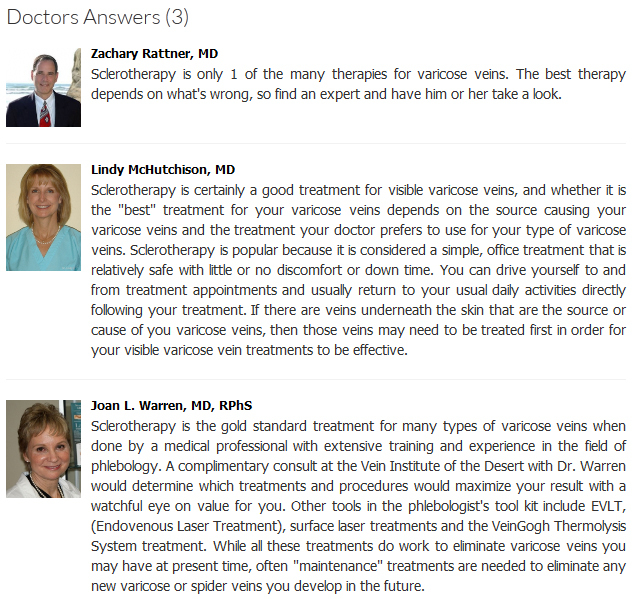 In addition to being able to publish written answer content, Premium Accounts can advertise on answer videos. These videos are specifically designed to capture web traffic related frequently asked questions in your medical field. DoctorQA.com will send videographers to your place of business to create 5 custom videos related to your practice. This promotion will only last for a limited time. We will give you roll in advertising so that an advertisement for your practice will display at the beginning of 5 answer videos. 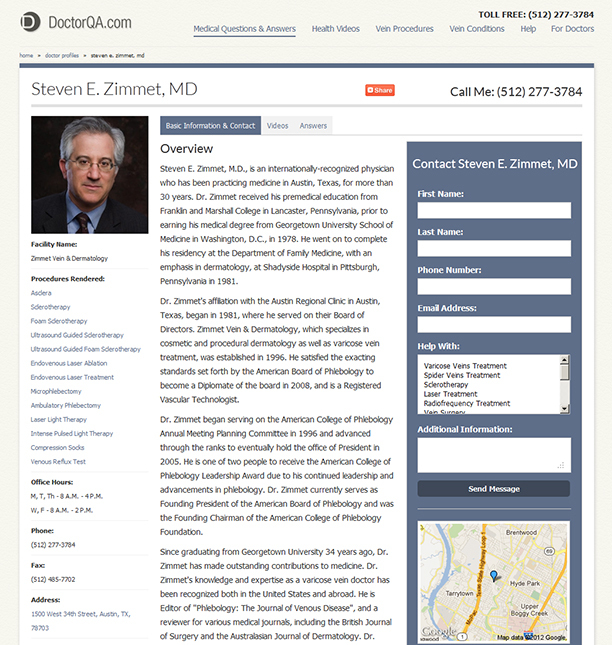 DoctorQA.com profiles are meticulously designed to convert local prospective patients. Profiles make it simple for consumers to find your contact information, custom videos, QA answers, patient reviews, map location, biography, and insurance carriers. Our QA functionality enables members to directly—and easily—interact with prospective patients. It’s as simple as replying to an email. Consumers ask questions related to your medical field and each email answer creates a brand new permanent, searchable billboard for your practice. You’re never obligated to answer questions. But the more you answer the more online exposure you give yourself. Our complete social media integration enables members to effortlessly tap into some of the largest emerging markets on the web. All you do is respond to consumer email questions about your medical field, and they’ll display on Facebook, Twitter, and LinkedIn. So we maintain your social media presence for you; you don’t even need to sign in. Your answers will display as posts in Facebook, tweets in Twitter, and updates in LinkedIn. Consumers submit millions of online searches for medical information every month (Google Analytics). The DoctorQA.com team has 10 years of experience converting search engine traffic into actual patients. We’ll clearly define your results through transparent bimonthly analytics reports because you deserve to know your return on investment. In these reports we’ll show the number of times your profile has been viewed, the number of potential patient inquiries, and we’ll outline your participation on the site. Upgraded listings also receive reports showing how many potential patients have contacted their practice through their DoctorQA.com telephone tracking number. Standard and Premium Accounts are featured throughout the site. For instance, if a consumer asks a question or searches for a local medical professional, your profile will be prominently displayed over other doctor profiles. If you step your online visibility up to the next level with the Premium Account, then we’ll display your listing on the homepage when local consumers come onto the site. We do this by utilizing state of the art IP tracking. If you upgrade to the Standard or Premium Accounts we’ll give you a custom badge that you can display on your personal website. 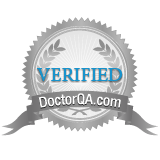 This branded badge will link back to your DoctorQA.com profile where users can view all your information and latest answers. We’ll give you the code you need so the badge installation is a breeze.